Sixty years ago, on April 25, 1953, American biologist James Watson (b. April 26, 1928) and English physicist Francis Crick (1916-2004) formally announced they had discovered "the secret of life"— the double helix that forms DNA, the molecule containing the genetic instructions for all living organisms. They published their findings in the scientific journal "Nature." What is likely one of the first written records of the discovery was just auctioned for $6 million: a letter from Francis Crick to his 12-year-old son, who was away at boarding school. The seven-page letter dated March 19, 1953 explains in detail the double-helix structure of DNA, complete with illustrations. Although Watson and Crick are credited with this discovery, their research stands on the shoulders of others who came before them as well as contemporaries who contributed to their understanding. DNA (deoxyribonucleic acid) was actually identified in 1869 by Swiss chemist Johannes Friedrich Miescher (1844-1895) at the University of Tübingen, Germany. Miescher was in the process of studying the protein content of white blood cells when he discovered a substance in the nuclei that had chemical properties that were different from a protein. He called the substance "nuclein." Although he published his findings, the significance of his discovery wasn't appreciated until about 50 years later, after his death. Another pioneer in the field of genetics was Albrecht Kossel (1853-1927), a German biochemist. He won the Nobel Prize in 1910 for isolating and describing the five organic compounds present in nucleic acids: adenine, cytosine, guanine, thymine, and uracil. Lithuanian-born biochemist Phoebus Levene (1869-1941), who emigrated to the United States in 1893 after studying medicine in St. Petersburg, Russia, was the first to discover the order of the three major components of a single nucleotide (phosphate-sugar-base); and the first to discover the carbohydrate components of DNA and RNA (deoxyribose and ribose, respectively). Levene is known for his tetranucleotide hypothesis, which proposed that DNA was composed of equal parts adenine, guanine, cytosine and thymine. However, later research showed this model to be too simplistic. The work of Erwin Chargaff (1905-2002), an Austrian-born biochemist who emigrated to the United States, was instrumental in the discovery of the double helix. His research led him to propose two rules, which became known as "Chargaff's Rules." The first was that the number of guanine units equaled the number of cytosine units, just as the number of adenine units equaled the number of thymine units, but that these two numbers differed. This discovery discredited Levene's tetranucleotide hypothesis and eventually led to the base pairing model. He informed Watson and Crick of his findings in 1952. Chargaff's second rule was that the composition of DNA varied from species to species, meaning that DNA was likely the carrier of the genetic material, not the protein found in cells, as was thought at the time. Watson and Crick were also aided in their discovery by Maurice Wilkins (1916-2004) and Rosalind Franklin (1920-1958). Franklin had taken X-ray photographs of DNA that her colleague, Wilkins, showed to Watson. The X-rays showed that the two strands of DNA could not be parallel, suggesting the helical nature of the strands. When Watson and Crick won the Nobel Prize in 1962 for their discovery, it was shared with Wilkins (Franklin had died a few years earlier). Once Watson and Crick announced their discovery, work continued to further define and map the genes that make up human DNA. 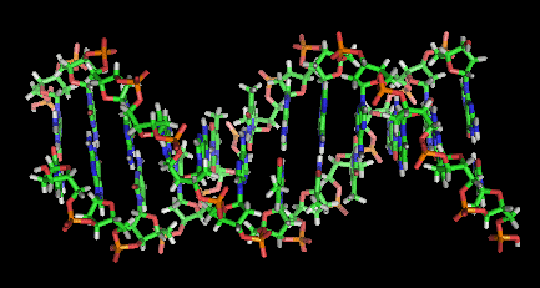 Ten years ago, the Human Genome Project was completed. The purpose of the13-year project, coordinated by the U.S. Department of Energy and the National Institutes of Health, was to identify the 20,000-plus genes in human DNA and determine the sequences of the three billion chemical base pairs that make up human DNA. Last year another milestone was reached: the initial results of the Encyclopedia of DNA Elements (ENCODE) project, launched in 2003, were released in a series of 30 papers published in multiple journals, including Nature, Genome Research, and Genome Biology.The goal of the ENCODE project is to identify all functional elements in the human genome. As DNA research becomes even more complex, it's fitting to take a look back at, and honor, the original genetic scientists. Although most of the original genetic researchers have died, James Watson, at 85, still lives to see the scientific breakthroughs that have been made as a result of his discovery.